It’s the 1st of December and I’m sure many of you are now getting your warm coats and scarves on ready to go hunt down the perfect tree for christmas, chop it down and drag it home. Ok, it’s probably more likely you’re nipping to the local b&q to buy one pre-cut but let’s give a moments thought to how you should pick it up and carry it home. Of course, we’re going to be looking at the ergonomic method. Ergonomics is the science of adjusting the task to the man. It is concerned with the motion and activity of people, their use of tools and machinery, and the design and arrangement of work for greatest safety and efficiency. Injuries can occur when there is a mismatch between the physical demands of a task and the capacity of the person doing the task. Lesson 1: Bend the knees not the back! You might have heard this one before. 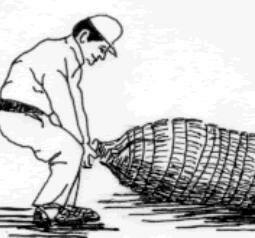 When lifting anything heavy (like a big christmas tree) you should bend down using your knees, keeping the back as straight as possible. Pick up the object and stand up using your legs to bear the weight (push up from your knees). Leg muscles are much stronger than back muscles. Trying to lift using only your back muscles can result in bad back syndrome and i’m sure you don’t want to have a bad back over the festive season. Wrong! This man is bending his back and not his knees. Ouch! Right 🙂 This man bends his knees, using his strong leg muscles to lift the tree. Minimises strain on the back and arm muscles. Aids grip and lift. 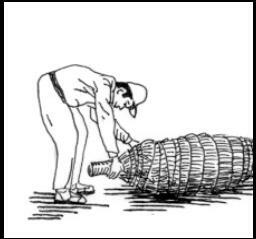 If the tree is particularly heavy get a friend to lift the other end. Wear sensible clothes that cover your skin and protect it from the needles. Gloves are a must! Ok you may feel a bit stupid doing this one but it will benefit your muscles and decrease risk of injury if you stretch before and after lifting a heavy object. More christmas tips to come! Have a happy ergonomic christmas!